You have an arresting title for your talk at the eyeforpharma conference: Artificial Irrelevance: Do physicians actually care about Healthcare’s AI Revolution? Can you tell us about the premise behind that? The first is a reaction to media speculation that the Artificial Intelligence (AI) revolution is going to make doctors irrelevant and obsolete. Part of my talk will aim to illustrate the fallacy here, and that, just as mathematicians were not made obsolete by the invention of the calculator, neither will physicians be made irrelevant by the invention of analogous technology. Instead, I believe it will empower them, freeing them to concentrate on the most important aspects of medical practice and patient care. 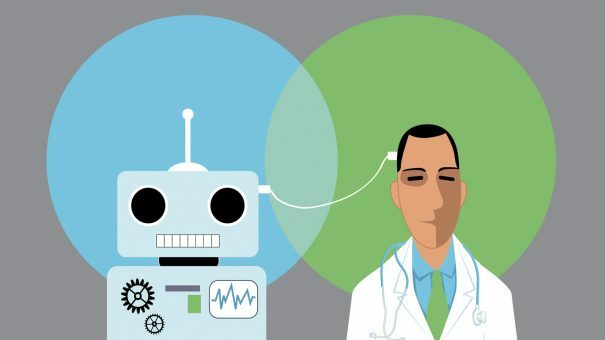 With respect to the relevance of AI to today’s practising MDs, I’m going to discuss physician attitudes about AI in Healthcare and what we need to do to ensure that we are designing products that make a difference in meaningful ways, such as patient outcomes and day-to-day clinical workloads. My company has conducted an illuminating survey in this regard, and I’ll pass on some of those insights in Barcelona next week. Finally, there’s an element of whether pharma marketers should be concerned about AI at all – is this just the latest cycle of the buzzword train, or are there meaningful opportunities to use this new technology to help educate and engage physicians? I’m looking forward to a lively discussion on that question. How can we deal with hype and identify truly meaningful innovation in healthcare? Does VR have the potential to have a transformative impact on most physicians on the planet? Of course: in 20-30 years, I expect that we’ll be living with Black Mirror-style devices that can construct any reality we can imagine. In the shorter term, even VR powered by today’s technology has the potential to transform aspects of physician education and training, and you’ll actually be able to see demonstrations of some compelling use cases from our MedSims team at eyeforpharma. In the immediate term, however, the technology to reliably create these experiences hasn’t found its way to mainstream physician offices at scale – and that’s something it’s important to consider when creating these solutions. We’ve had opportunities to send Google Cardboard-style viewers to physicians and make linear 360-videos available to them, but that smells like something that our physicians would use one time and would then sit neglected in a top drawer somewhere. We could pursue that opportunity just to chase a modest short-term bounce, but it doesn’t feel like something that’s truly meaningful for our users, and so for now we try to execute against VR use cases in a controlled educational setting. By focusing on interactive training at functions like live events and conferences, we can ensure we’re offering the best possible experiences on state-of-the-art equipment. And this pursuit of respecting a user’s native workflow is something we should all be paying more attention to: If we get away from technology for technology’s sake and focus instead on how our users really operate, it just makes the solutions we’re building that much more effective and meaningful. The power of social media and digital communications is starting to worry a lot of people. How should we respond as a society? I share their concern: our children are the first generation to come of age in a society where so many of us are obsessively curating our self-image in order to obtain the Likes and Hearts of social media, and it’s too early to determine the long-term health consequences. Considering how these products have re-shaped the social fabric, you start to get a sense of what an enormous responsibility it is to build user experiences in 2018 – it’s not just software, it’s about real people’s lives. So, the ‘Why’ behind what we build and how it affects our 80 million+ monthly users at WebMD is something we take incredibly seriously – and that’s why we work closely with our partners – to understand our users’ and stakeholders’ needs and collaborate in building truly meaningful solutions. Ben Greenberg is vice president, Product Management & User Experience at WebMD. Eyeforpharma Barcelona takes place next week, 13-15 March.